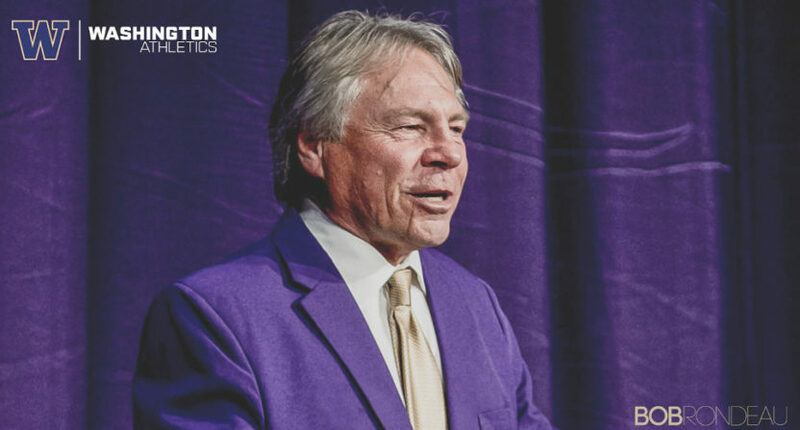 Famed Washington Huskies' announcer Bob Rondeau is retiring after 37 years. There are some great stories about him, including how he met his wife Molly when she was pressed into spotter duty. Molly’s best stories are about how they met, got engaged and their wedding ceremony. She said they met in the press box at Sun Devil Stadium in Tempe, Ariz. Molly, through her job, met and became friends with former Seahawks quarterback Sam Atkins. Molly and another friend were on vacation in Arizona when she got a phone call from Atkins, who was Rondeau’s partner in the booth. “Their spotters didn’t show up. Sam said, ‘I got a couple buddies who can spot,’ and Bob was like, ‘Go get them,’” she recalled. “They were getting ready to go on the air. He brought me up and my best friend up and we walked through the door and he’s always a gentleman. Rondeau asked which of the two women knew football better and Molly said she did. “He put me on Arizona State and I did not miss a play the whole first half,” she said. That’s definitely a pretty good way to meet, one very fitting for a life in broadcasting. And it led to the two talking, and Bob finding out Molly’s father played football at Notre Dame. They then bet a dinner on the outcome of a Notre Dame – Florida State game; Molly won, so Bob bought dinner, and they started dating. It was 24 years ago that they met, and they’ve now been married for 20 years. Oh, and they got married at the 50-yard line of Husky Stadium. That seems fitting, and it’s nice that there’s a great Apple Cup matchup to send Rondeau off, with #13 Washington State against #17 Washington. He’ll certainly be missed by many, and Clark’s story is cool to see for its exploration of the man behind the microphone.